L.A. Mayor Eric Garcetti closer to 2020 bid, says race will be about "getting s*** done"
Los Angeles Mayor Eric Garcetti is nearing a final decision about a possible 2020 presidential campaign, signaling Thursday that he has thought deeply about how the Democratic Party should approach President Trump in the coming years. "Before, you know, I was thinking about it, but not as hard as I am now," he said, adding later that he expects to make a final decision "in this first quarter of the coming year." 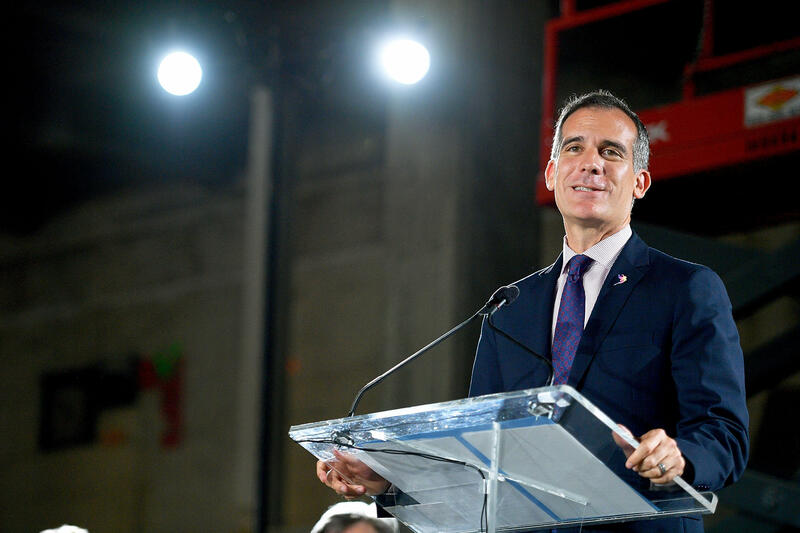 Garcetti, 47, won reelection to a second term as Los Angeles mayor last year. He is among a handful of California Democrats, including Sen. Kamala Harris, Rep. Eric Swalwell and billionaire activist Tom Steyer, and big-city mayors, including New York's Bill de Blasio and former New Orleans Mayor Mitch Landrieu, who are mulling potential campaigns. The 2020 election "is going to be about three things: It's going to be about national unity, it's going to be about winning the future, and it's going to be about getting s*** done," he said. "People hunger for national unity and you have to give that offer," he added, citing Beto O'Rourke's recent unsuccessful U.S. Senate campaign as a movement that resonated by focusing on a broad message of unity even if the congressman ultimately lost. Speaking at a reporter breakfast hosted by Bloomberg News, Garcetti said that if Trump can win the presidency – "a billionaire from Manhattan -- from Queens originally -- but, like, you know, if he can do it, we can certainly show that people can do it in a better way." "I'm also sick and tired of a president who doesn't want to be a president for all of America and for all Americans," he said. "I think the -- and -- and anybody on the other side who wants to run against him, who wants to be a president just for our tribe -- collective tribe, I don't think's going to win. And if he or she wins, is not going to be an effective president." Democrats, Garcetti said, should focus more on Trump's actions and less on his words. In 2016, "We attacked his weakness, which was his -- especially racism, misogyny, all that stuff, instead of his strength. Now, his strength is a different strength than any other politician I've ever known. He has practiced actually seeming strong. Strength is his strength. He's really practiced his entire life. Never show weakness, always project strength, come at people." "You have to know how to attack this strength, which to me is actually quite easy -- you have to be able to not get riled up, get -- ignoring doesn't work, yelling back doesn't work, but you have to be able to kind of point out that, you know, Donald Trump is saying a lot of stuff, that he's a great deflector. He says stuff that we all say around our, you know, table about trade, about jobs, about, you know, the core stuff that resonated with folks. But it's not like he thought that up." Addressing the president's work on the economy, Garcetti said that the Democratic nominee should "take him on at a level where you're calm, where you say something like, 'You know what, Donald? You're the American dream. I mean, you're a hustler....You've been married to three amazing women,...you've been bankrupt, you've -- you've come back, you know, this is like what America's about. You can reinvent yourself,...and that's awesome.' The question is, the stuff that he was selling you, how's that working for you? You know, you told me that health care was going to come down, and that the trade deficit was going to be lowered. But the cost of health care has gone up. Our trade deficit with China has soared." Garcetti added that he hopes the next presidential campaign addresses a growing sense of what he calls "Anxitement" -- anxiety and excitement -- around the ongoing technological revolution that makes it easier to communicate with each other, but is also fundamentally reshaping certain industries and jobs. "We have this moment where the future is scary right now to people, and somewhat exciting. But nobody's talking about winning that future," he said. Garcetti is the son of former Los Angeles County District Attorney Gil Garcetti, who led the prosecution of O.J. Simpson, a veteran Naval Reserve intelligence officer who is Jewish, Mexican and Italian -- attributes that make for a gold-plated political biography and background. Asked how he might share with voters his unique background, he said, "You don't talk about it as a thing, you talk about yourself and your history. You talk about where your family comes from. You share your story of where you -- where you talk to god and how you share your faith." "Barack Obama didn't say, 'Hey, I'm the black candidate.' He said, 'This is who I am, this is my history,'" Garcetti said. "That campaign taught me Americans want to make history, but they don't want it to be about making history." The National Transportation Safety Board is investigating after a small plane crashed in Kerrville, Texas. The six people on board were killed. Mireya Villarreal reports.